The Titanic Museum Attractions – the home base for the U.S. RMS Titanic 100 Year Anniversary Commemoration – are half-scale recreations of the RMS Titanic on the exterior and, inside, “passengers” will find full-size recreations of the Grand Staircase, First Class Suites, Third Class Cabins, Dining Rooms, etc. built directly from actual RMS Titanic blueprints. 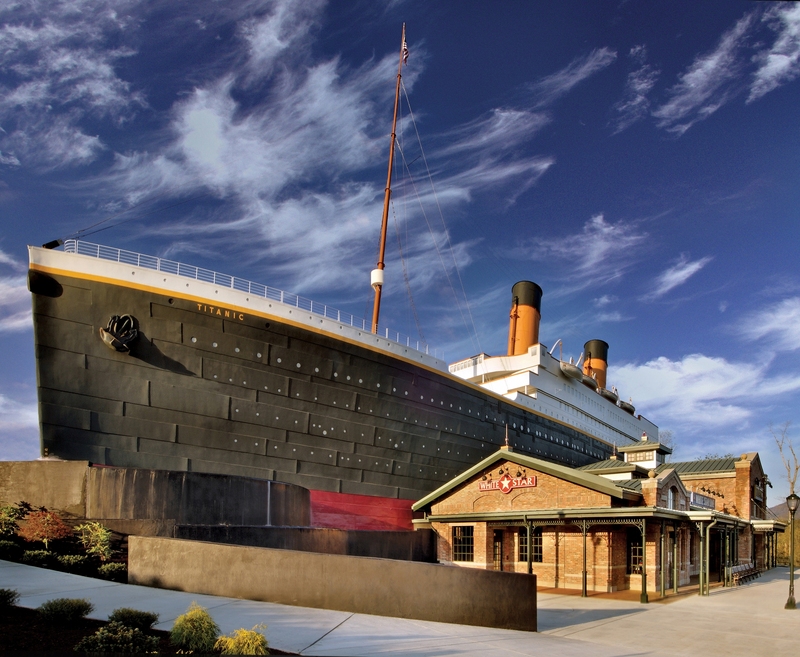 Titanic Museum Attractions in Pigeon Forge, Tenn. and Branson, Mo. are hosting “A Night to Remember: An Original Musical Tribute to Titanic,” on Saturday, April 14, the 100th anniversary of the night the ship struck an iceberg on its maiden voyage. Musical performances, historic ceremonies and appearances by actual descendants of Titanic’s passengers and crew will highlight the production honoring the 2,208 people aboard the ship. Adding to the historic occasion, descendants of people aboard the Titanic’s maiden voyage will also be present at the American tributes. The ceremony will conclude with a symbolic reenactment of the launching of Titanic’s distress flares and the lighting of a memorial flame at the bow of the ship to honor the 2,208 people aboard Titanic. The musical tribute will begin at noon (Central) on April 14 at the Titanic Museum Attraction in Branson, Missouri, and at 8:30 p.m. (Eastern) the same day at the Titanic Museum Attraction in Pigeon Forge, Tennessee. Tickets for the unique historical tribute are available beginning Monday, February 20, by calling 800-381-7670. “There will be ceremonies across the globe to commemorate the Titanic centennial on April 14, but the only place in the United States where guests can attend a formal tribute is at one of the Titanic Museum Attractions,” said John Joslyn, co-owner of Titanic Museum Attractions and co-leader of the first private expedition to visit the ship’s final resting place on the ocean floor. “A Night to Remember” will use choirs, orchestras and musical theater performances to bring the stories and drama of that fateful night to life for those attending the one-time only tribute. The Titanic Museum Attractions are located in Branson, Missouri, and Pigeon Forge, Tennessee. Together, the two museums represent the largest permanent monuments in the world dedicated to the memory of Titanic. The museums, immediately recognizable for their ship-shape design, are home to hundreds of artifacts from the ship and its survivors. “Passengers” experience what it was like to walk the hallways, parlors, cabins and Grand Staircase of the Titanic while surrounded by artifacts and exhibits that tell the story of the ship’s history and fate. To commemorate Titanic’s Irish heritage, Titanic Museum Attractions in Branson, Mo. and Pigeon Forge, Tenn. will give away six 11-day trips for two to Belfast beginning today. The 12 winners of the “Back to Titanic 100th Year ‘Tour Ireland’ Sweepstakes” will go to Belfast where they will visit the birthplace of the world’s best-known, most luxurious ocean liner. Winners receive airfare to and from Ireland, ground transportation, and hotel accommodations. The Back to Titanic 100th Anniversary Tour begins in Belfast, where winners will learn the history behind the world’s most famous ocean liner. Their journey continues in Dublin where they’ll take advantage of everything the beautiful city has to offer. They’ll also have a special presentation by Rory Golden which will include the first-ever images of the discovered Titanic wreck and the impact Titanic has had on society. Winners will experience many breathtaking areas of Ireland with guided tours and exclusive events taking place in Belfast, Dublin, Cobh and Kilkenny offered only to these travelers! To enter the “Back to Titanic 100th Year ‘Tour Ireland’ Sweepstakes,” visit www.TitanicAttraction.com and click on the sweepstakes banner to register. Each person entering the sweepstakes may enter one time per day between June 13, 2011 and Feb. 1, 2012. The winner will be drawn in early February 2012. In May 1911, the RMS Titanic slid down Slipway No. 3 at the Queen’s Yard of Harland & Wolff and settled on the waters of the Victoria Channel in Belfast, Ireland while more than 100,000 people looked on. At the time, she was the largest movable manmade object on the face of the planet. In the coming months, RMS Titanic would complete numerous successful sea trials with Irish workers and crew members on board. The following April, when Titanic set sail on her maiden voyage, the world watched as the A-List celebrities of the day – the Astors, the Strauses and Guggenheims – boarded alongside everyday working-class people. Four days later, after striking an iceberg on her starboard side, those same diverse passengers would carry out amazing acts of generosity, kindness and heroism as well as unthinkable acts of cowardice as they struggled for their lives in the early morning hours of April 15, 1912. It has been 99 years since a lookout in the crow’s nest shouted, “Iceberg right ahead!” For the twelve months leading up to April 15, 2012, when it will have been a century since the RMS Titanic was lost, Titanic Museum Attractions will pay respect to and honor those 2,208 passengers and crew members with an ongoing series of special events, activities and ceremonies. As the whole world remembers the world’s most famous luxury liner, Titanic Museum Attractions will continue to open the door to the past in it’s one-of-a-kind way – letting “passengers” experience what it was like to walk the hallways, parlors, cabins and Grand Staircase of the Titanic while surrounded by more than 400 artifacts directly from the ship and its passengers. As visitors touch a real iceberg, walk the Grand Staircase and third class hallways, reach their hands into 28-degree water, and try to stand on the sloping decks, they learn what it was like on the RMS Titanic by experiencing it first-hand. Each and every day, Titanic Museum Attractions provides a gateway to 1912, where First Class Maids and a variety of Officers and crew members bring the stories of the fabled ship and its fascinating passengers to life by retelling their stories in vivid, dramatic detail. The priceless artifacts throughout the museum shed additional light on the lives of those passengers and crew members when guests see the actual belongings of those on board and artifacts that sailed on Titanic’s maiden voyage. The Titanic Museum Attractions in Pigeon Forge, Tenn. and Branson, Mo. opens daily at 9 a.m. Reservations are strongly suggested (many days sell out entirely). Or, passengers may purchase tickets online at www.TitanicAttraction.com or by phone at 800-381-7670. For more information and details about the “Back to Titanic 100th Year ‘Tour Ireland’ Sweepstakes” visit www.TitanicAttraction.com.